This is an attempt to create a canonical question that covers all instances of "low-graphics mode" error that occurs to a user, including but not limited to installation of wrong drivers, incorrect or invalid lightdm greeters, low disk space, incorrect installation of graphics card like ATI and Nvidia, incorrect configuration of xorg.conf file while setting up multiple monitors among others. If you are experiencing the "low-graphics mode" error when trying to login but none of the following answers work for you, please do ask a new question and then update the answers of this canonical question as and when your new question gets answered. How do I fix the failsafe X mode and login into my computer? Boot PC leaving SHIFT pressed to make the GRUB Menu show. Select Recovery Mode which will continue booting correctly until the Recovery Menu appeares. Select from the recovery menu failsafeX. In some cases failsafeX will load fine (You lucky dog), for others (Me) it will give an error along the lines of "The system is running in low-graphics mode" and will stay there forever. When this happens, press CTRL+ALT+F1 to go to the terminal. Type in your Username and Password. For other cases see this answer for details and follow the links there to help you along the way. The simple way is to sudo apt-get install fglrx. If this does not work keep reading. Go to AMDs support site and download the driver you need. (If you have a newer card, you may want to download be the latest beta driver instead of the stable one. You would need to compare release dates and read through release notes to find out which driver version supports which chips.) Put the downloaded driver in some folder and rename it to "amd-gpu.run" to simplify name. Go to the folder where you downloaded the file and type chmod +x amd-gpu.run to give it Executable Permission. Now just simply run ./sh amd-gpu.run and follow the onscreen steps. After rebooting all problems should be solved. If you test 'Additional Drivers' with a problem like this it will finish downloading the package but then it will give an error. It also gives the same error if you use 'Software Center' and 'Synaptic'. The only way was to go to the failsafeX option and do the workaround about changing to the tty1 terminal and doing it via command line. Now you must get back access to the Unity desktop(Of course with the AMD driver uninstalled). Then you can get to this site which clearly helps in choosing the right AMD driver for your System specifications. Also read the release notes for the latest driver for your graphic card(Especially check if your system satisfies all the system requirements). Then after downloading your driver installer(the .zip file) get to this site and follow the instructions to install your driver. Your driver must be installed and it should work successfully. Always use the nvidia-current package or the nvidia-current-updates one. These are tested and approved already for the Ubuntu version you are using and will give less errors and incompatibility bugs. Warning: This PPA is very unstable for some things. So do it with that in mind. After that sudo apt-get update and you should receive several updates. X-Swat currently does not have Intel drivers in the latest versions of Ubuntu. UPDATE 1: Added this extensive answer to solve many of the problems that might end with the error mentioned here: How do I install the Nvidia drivers? UPDATE 2: AMD is no longer releasing (stable) graphics drivers on a monthly basis and not all graphics chips are supported by their Linux drivers upon product release. At the time of this update the latest stable driver is almost 5 months older than the latest beta driver. You should look at the release notes to check if there is a driver that supports your graphics chip and the software versions you are using (X.org xserver or Mir). Like always please test and give feedback so I can enhance my answer since others will be also reading it. The better it is, the more people it will help. I solved this problem by reinstalling ubuntu-desktop. When the message that "your system is running in low-graphics mode" appears, press Ctrl+Alt+F1, then login with your credentials. This is a bug in LightDM and a bug report has already been filed. The reason why you end up with this failsafe X is because the pantheon-greeter you installed along with the elementary desktop is now not available and LightDM is not able to identify an alternative greeter. As a workaround, you can edit the LightDM conf file and correct the error. After changing the file, reboot and you will now be greeted with Unity greeter. Try moving personal files off the computer onto a USB drive. If you see that there is no space available on the root (/) then you need to free some space. When this happens there is often an error message indicating why it failed to start X. Look in your /var/log/Xorg.0.log.old or /var/log/Xorg.0.log. The error (if there is one) will be at the tail end of the file. Another good place to look is the log files in /var/log/gdm/* (or /var/log/lightdm/* in oneiric and later). Did you happen to manually install fglrx prior to noticing the problem? If it was not uninstalled properly it can cause weird random issues. Directions for purging fglrx are available at here. Is your video card an AGP model? If so, a common issue with ati agp cards is having an incorrect AGPMode. Sometimes you can adjust this setting in your BIOS (which perhaps windows screwed with?) There is also a setting in /etc/X11/xorg.conf for adjusting it in X. It is not related to Nvidia drivers. Because by default Ubuntu uses non-Nvidia drivers even though you might have Nvidia GPUs. I have an Nvidia GPU too. My Ubuntu used to boot fine until something happened which caused the same issue. After reading posts, reading logs and little bit trial and error, turns out the problem is related to lightdm GUI server. I don't know solution to the problem but there is a quick work around in 3 steps. This will save you from reinstalling Ubuntu. When the error shows up, hit Ctrl+Alt+F1. This will open the command line interface. Login as root. Remove a particular X11 config file. This file is not really required. 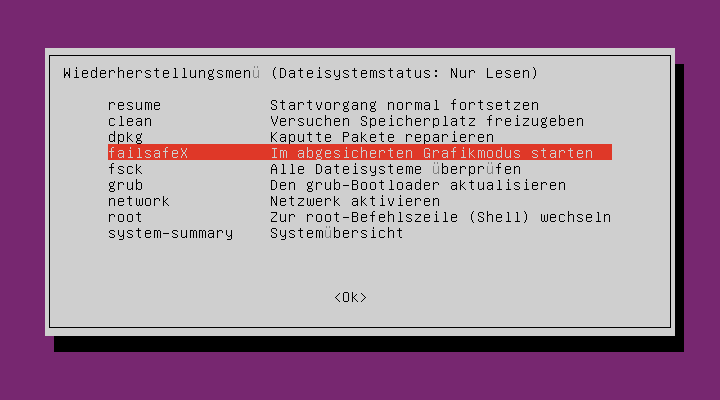 Somehow, the existence of the above X11 configuration file causes the OS to throw that error. This will restart the lightdm GUI server and voila your desktop is back! Let's assume, arrogantly, that it is a problem with your X display manager.
. . . and choose gdm. According to https://bugs.launchpad.net/ubuntu/+source/linux/+bug/1070150 this is a way to workaround a bug with lightdm. 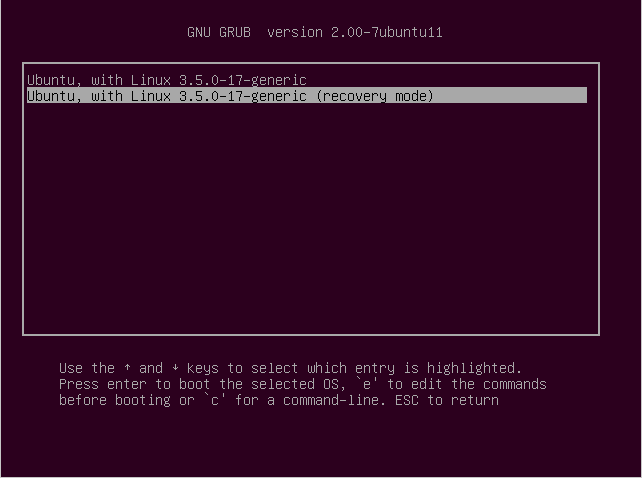 The same can be done from the recovery mode (after enabling networking), if your Ubuntu completly refuses to enter anything but recovery mode. These commands did the trick for me. It took very long to start after the reboot, 10+ mins. But I got in eventually. If you have a problem with the restricted (closed source) driver , then try to remove it. Goto Additional drivers and remove the dirver. You have to mark the Using X.Org X server -- Nouveau. If you have not access at all to the Desktop Environment then use the Recovery Mode. Select the Network and your root partition will mounted as Read-Write. The last command will reboot your system and hopefully you will login normally in next reboot with the Open Source nouveau driver. 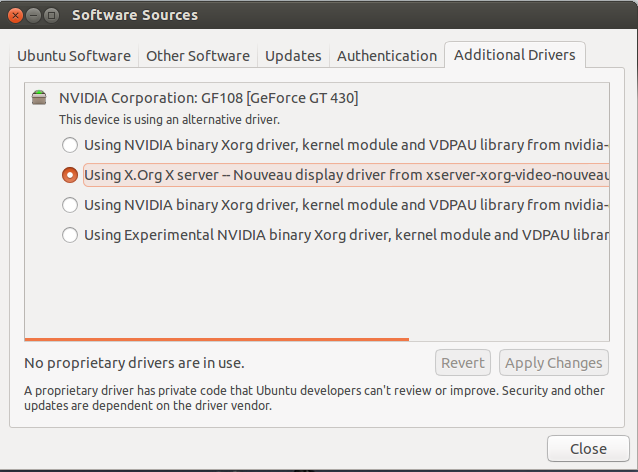 According to this answer : Ubuntu 12.10 Desktop does not show when I installed nvidia drivers! may need to install or reinstall the linux-headers to get the restricted Nvidia drivers work properly. Try delete your /etc/X11/xorg.conf and restart. When I used startx on the command prompt however, everything was fine and i could start the xserver. now everything's running. Hope this helps you. Well, I had the same problem and solved it. 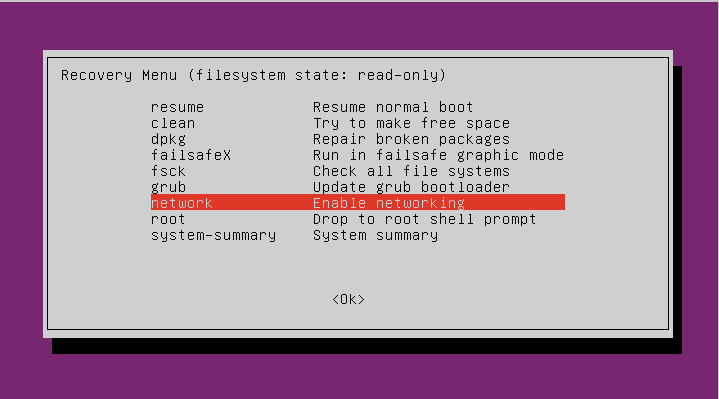 Start ubuntu with recovery mode from grub then choose filesystem check followed by enable networking. Then reinstall the drivers following the methods for precise from this website https://help.ubuntu.com/community/BinaryDriverHowto/ATI. -everytime you complete a step. Good luck. 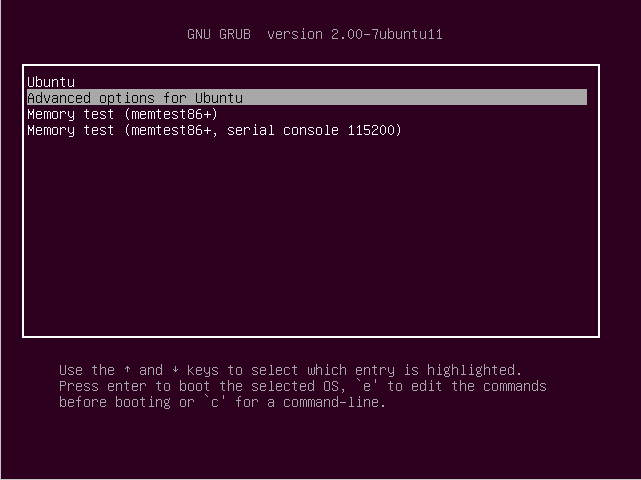 Install gdm from the default Ubuntu repositories. OIn 16.04 and later gdm has been updated to gdm3. GDM provides the equivalent of a "login:" prompt for X displays: it asks for a login and starts X sessions. During the installation of gdm you will be asked to select either gdm (or gdm3 in 16.04 and later) or lightdm as the default login display manager. Select gdm. fglrx has been discontinued in Ubuntu 16.04 and later in favor of the built-in AMD graphics driver. You might need to run: sudo aticonfig --initial, but that was not necessary for me. In my case the driver installation finished with an error, but it still worked. I hope this helps. Which ubuntu version are you running? Did you installed graphics drivers before the problem or is it a post clean-os-install issue? Giving some more info would be helpful for us to help you. Of course, if you have an ATI videocard you have to change the nvidia-* and nvidia-current for your ATI drivers package. Phenomenon: I first saw Booting without full network configuration message that never ended. After Action-1 below, I faced The system is running in low-graphics mode issue. Action-1: Force to shutdown the machine (by keeping power button pressed as normal). Choose recovery boot. Effective solution: Remove & install xserver-xorg, inspired by this thread. Edit) after creating xorg.conf and had it read in xserver, I faced the same issue again. This time, in addition to re-install xserver-xorg, I had to create /etc/X11/xorg.conf file (I did so by copying the backup file I already made). I just had to disable Internal Graphics Board on BIOS display. Your graphic card just do not support unity. Unity requires: Any graphics card with OpenGL 1.4 support (All GPUs released today by either NVidia, AMD or Intel; GPUs released by NVidia and AMD over the last 5 years; GPUs released by Intel after the GMA 950). If you card don't meet this requirements, then is just that you can't use Unity (yet). 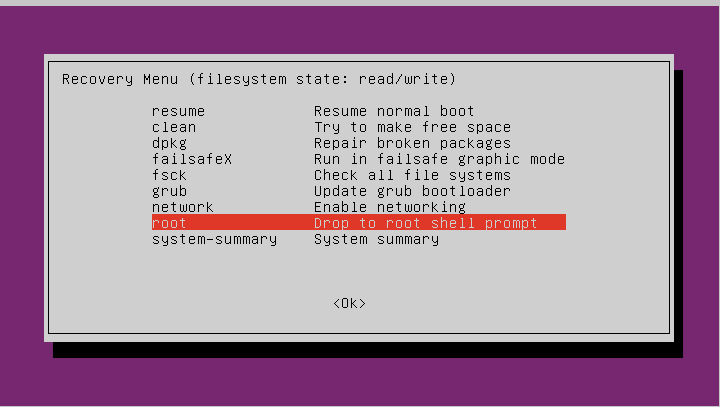 Try to boot from grub using a different parameter or even booting an older kernel from the list. You will most likely get errors on specific packages. Repeat the command removing the problem package until it works. There will be a time where you will be without the desktop, so have another internet connected device nearby to reference this from or to Google with in case of emergency. This worked for me, hope this helps. *If you are never prompted, just skip this. I had the same problem but this method works for me. When you get The system is running low-graphics mode error,press ctrl+alt+F1 ,it will take you to the console. It will get you back to the GUI login.Why this problem occurs means,after you installed graphics drivers,it creates xorg.conf file in /etc/X11 folder.Which prevents the system from GUI login. I had a special case of this problem, where I somehow caused the removal of some packages. I only noticed the actual problem after some time spent looking at the problem. This will ensure all the needed packages are installed. Without some of those, symptoms like those described here may occur. I had the issue when I upgraded from 11.10 on my Acer Aspire One AO-722. I also had the propriety ATi/AMD driver installed from 11.10, which carried over to the 12.04 installation. I followed this guide to remove the proprietary drivers and use the Open Source drivers. http://wiki.cchtml.com/index.php/Ubuntu_Oneiric_Installation_Guide#Removing_Catalyst.2Ffglrx Everything seems to be working now. Your Memory may be bad. If you experience Low graphics mode intermittently like I was. Run a memory check to check for memory errors. Run the memory test again, to make sure all is good. The Low Graphics Mode error should now be gone. Not the answer you're looking for? Browse other questions tagged xorg lightdm login-screen unity-greeter or ask your own question. How do I fix “Your system is running in low-graphics mode”? How can I get out of low graphics mode on 12.04? Your system is running in low graphics mode on 12.04 + no space left on device (issue)? Login fail with low graphics then crash? 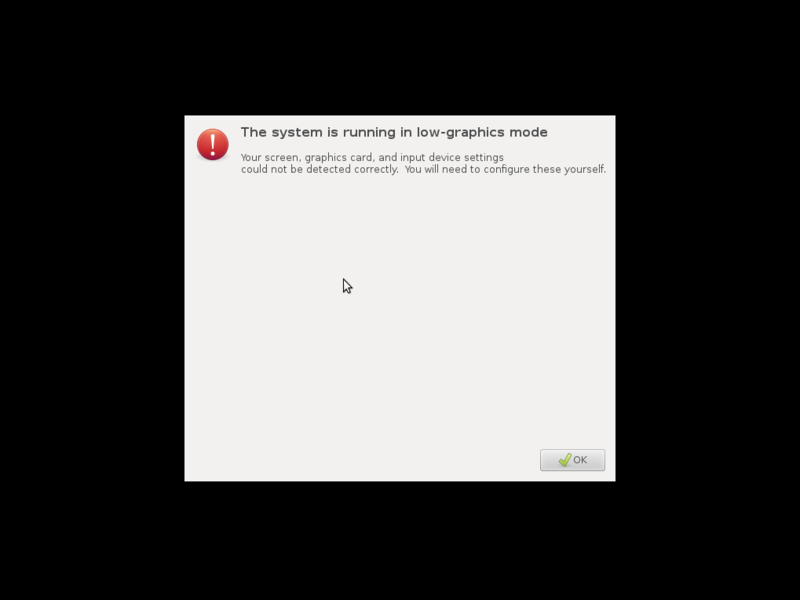 Another way to fix “The system is running in low-graphics mode” error? How do I configure the resolution on an HP Envy 15 with an AMD Radeom 7690M?